The wonderful author Kristina Knight recently wrote about summer essentials. Her post featured cute, comfy flip-flops and other summer must-haves. And it got me thinking. Because as a fair-skinned person who’s already had a few run-ins with skin cancer, my summer essentials have really changed. I’ve traded in my bathing suit tops for long sleeved swim shirts. A sunhat and strong sunscreen are a must if I venture into the sunshine for any length of time. And my summertime habits have changed too. Summer used to be about basking in the sunlight. Now I am constantly seeking my most essential of all summer essentials. Shade. So on the longest, hottest days of summer, when my town’s streets clog with tourists heading for the beach, I head for the hills. Literally. Because the mountains behind my town are thick with redwood trees. 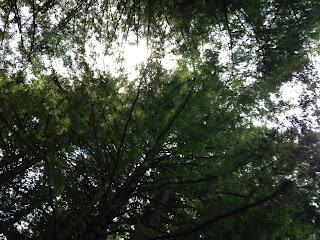 And there’s no more delicious shade, in my opinion, than that provided by a redwood forest. Walk among them on a warm day and you can breathe in a delicious dusty, smoky smell. 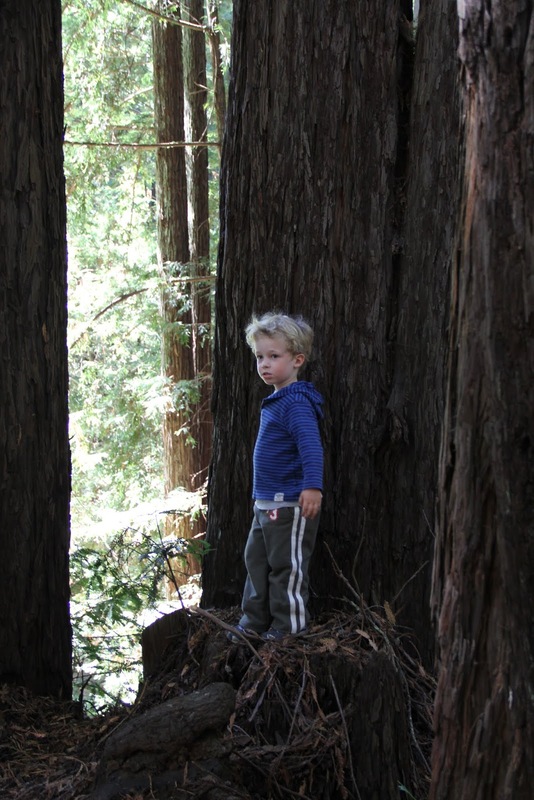 It's part pine tree, part soil, part, well… redwood! 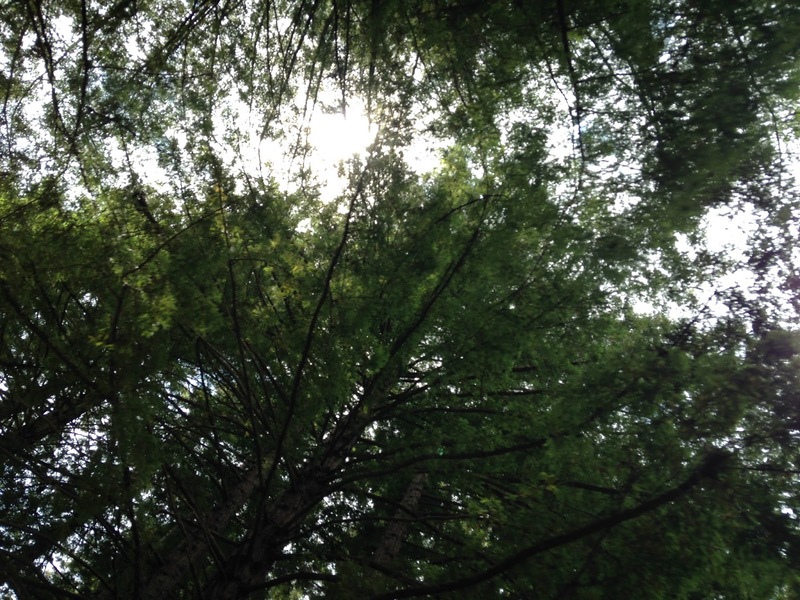 Look up and see the bright summer sky dappled and dimmed by millions of green needles. It’s an awe-inspiring sight! Have you had a chance to walk among these giants, or their slightly smaller cousins, the sequoias? 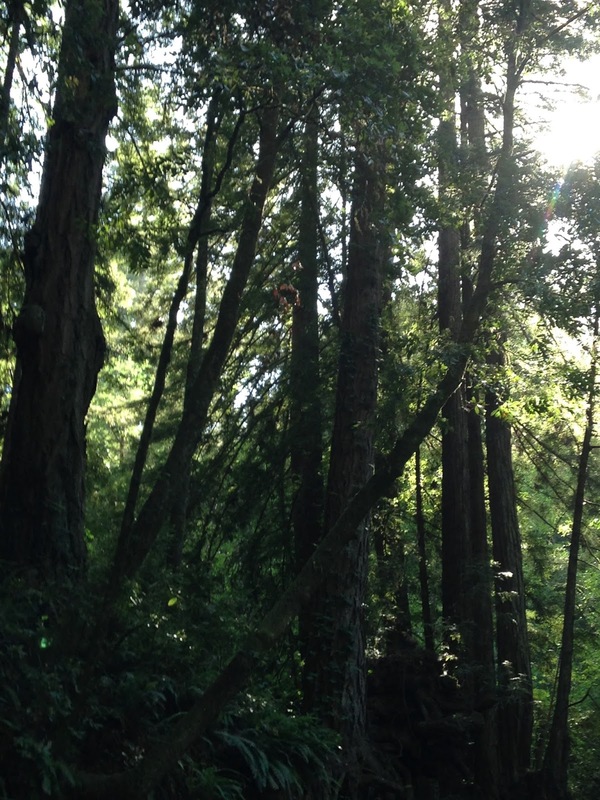 Coast redwoods are enormous, as tall as a thirty story building, the tallest trees on the planet. Even our local forests, heavily logged for years and containing almost no old-growth trees, are full of trees whose tops disappear into the sky. In the right conditions they can grow three feet in a year. A full grown tree might be three hundred feet tall and twenty-seven feet across. 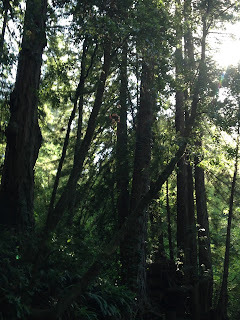 When I asked my husband if he had any photos of redwood trees I could use for this blog he said “What part of the tree?” And he wasn’t joking. They are so big that it’s almost impossible to take a photo of the entire tree. You can choose the top, or the trunk, a branch or two, but good luck getting a full photo! 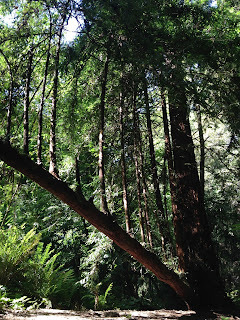 Walking in a redwood forest is like taking a trip back in time. The huge trunks and ferns make it easy to imagine a dinosaur peeking out from behind one of the trees. 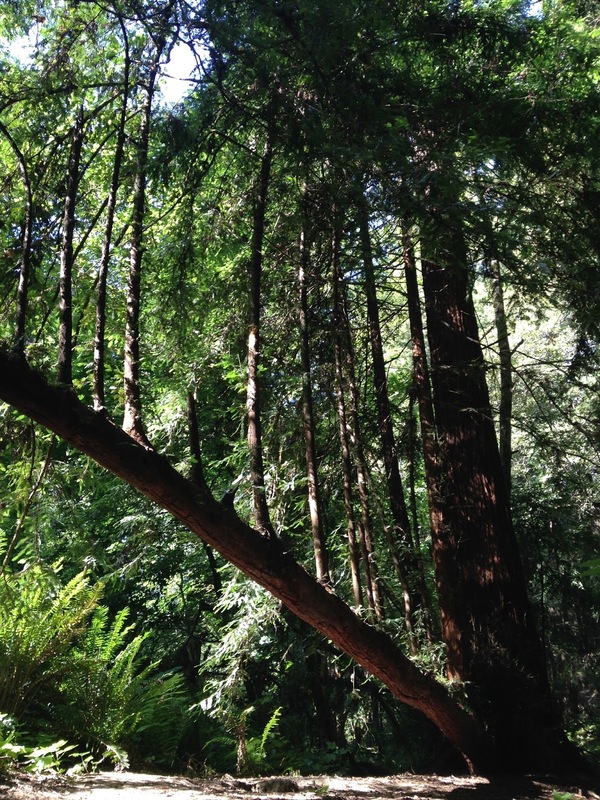 Plus, redwoods are real-life time travelers, living for over two thousand years. 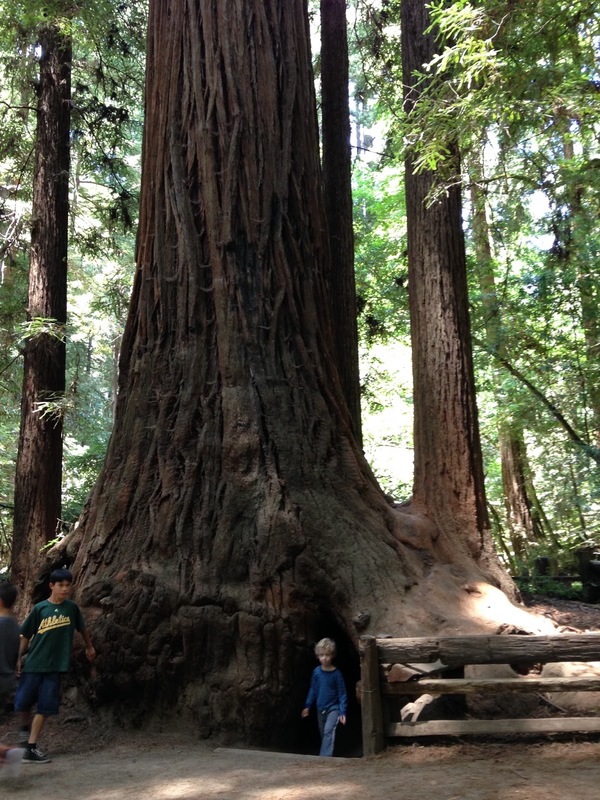 Stand next to an ancient redwood and you’re likely standing next to a tree that was alive during the Roman empire. It never fails to amaze me. A visit to the redwoods requires you to slow down and take your time. There are so many nooks and crannies to explore. Often you can find mossy creeks to wade in. 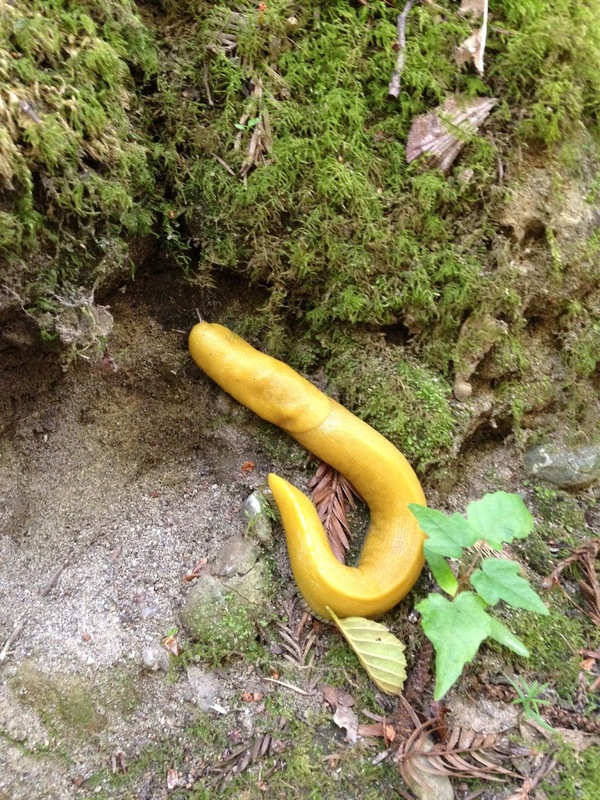 Strange creatures like banana slugs to observe. Stumps begging to be climbed. And occasionally, where the sun breaks through, a surprise of a flower. Redwoods have fire-resistant bark, so when a wildfire occurs, they often burn in the center, leaving a hollowed out cave in the tree. You can climb inside and feel the enormous, still-living tree surrounding you. Find one and sit quietly inside. You’ll be amazed by the peace you can find there. And the deep, dark, blissful shade. Where do you go to cool off, or hide from the summer sun? Do you have a shady peaceful spot that you love? 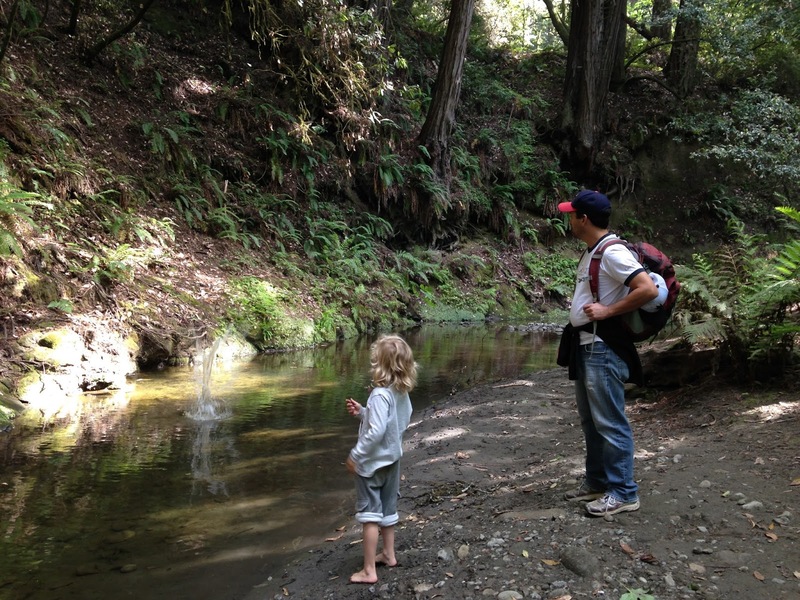 Or a place you love to hike or visit? Please share! There are some beautifully shady bike/walking paths here in town. Though I don't have to go further than my backyard really. About 30 years ago I planted a number of trees. They are now truly magnificent. I walk city trails, in and around a bunch of shade trees. When visiting my sister out west, we enjoy driving into the mountains and hiking there. Beau-ti-ful! gorgeous pics, Claire! One of our bucket list vacations is Northern California and the redwood forest. 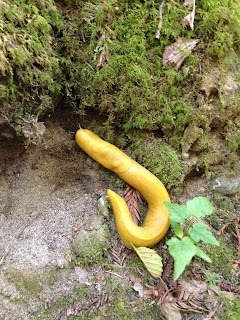 HI Laney4, I agree, I love hiking in the mountains. One thing we don't have here is those beautiful mountain views you get when you climb up really high. And I love swimming in mountain lakes. I am jealous of your trees. Our house has none. Well, it has two palm trees, but the previous owner planted them right under the electric wires, and the electric company says we have to cut them down before they get tangled in the wire. On warm days our house can get really hot because there is no shade! Thank you for telling us about the Redwoods. What massive trees they are. Truly awe inspiring. I love trees. I live in NC where there are so many beautiful varieties. During summer I run to the mountains too. I love the Great Smoky Mountains and the Blue Ridge Mountains. Hi Laurie! Thanks for stopping by. Lucky you to live near those great mountains. 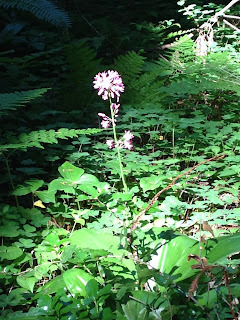 I had the opportunity to visit the Blue Ridge Mountains last summer and loved it! There was such a variety of trees and plants, and the views over the mountains were so pretty! Breathtaking. We like to get up to the Western North Carolina mountains for our escape from the summer heat. We don't have redwoods but we do have Angel Oak, a magnificent tree estimated to be up to 1000 years old. I'm old enough to remember before it was a protected site, fenced off, and made into a for-pay tourist site. No, back in those days, it was at the end of a dirt road and we could climb and walk along her branches. There is magic in the very air around her.